Robert joined TILDA in 2016 and is approaching the end of his specialist clinical training in Geriatric Medicine, with a clinical and research interest in brain health in later life. He has published widely in this field, with over 30 research papers in journals such as JAMDA, the American Journal of Geriatric Psychiatry and Hypertension, as well as two book chapters. 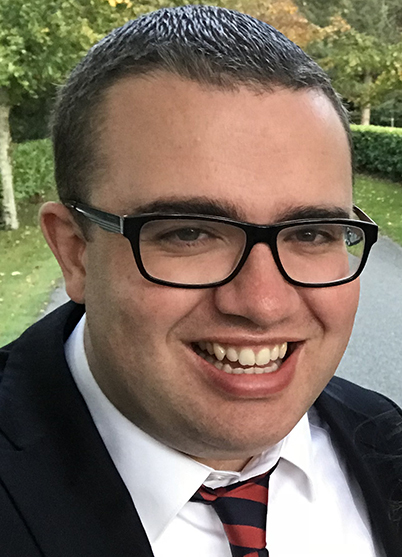 He was co-PI on Ireland's first interventional study in prodromal Alzheimer's Disease and he is currently undertaking a PhD examining the role of cerebral hypoperfusion in late life depression within the TILDA population. Briggs R, Carey D, Claffey P, McNicholas T, Newman L, Nolan H, Kennelly SP, Kenny RA. The Association between Frontal Lobe Perfusion and Depressive Symptoms in Later Life: Data from the Irish Longitudinal Study on Ageing. British Journal of Psychiatry 2018; in press. Briggs R, Carey D, McNicholas T, Claffey P, Nolan H, Kennelly SP, Kenny RA. The association between antidepressant use and orthostatic hypotension in older people: a matched cohort study. Journal of the American Society of Hypertension 2018;12(8):597 – 604. Briggs R, Carey D, Kennelly SP, Kenny RA. Longitudinal Association between symptomatic orthostatic hypotension at 30 seconds post standing and incident late life depression. Hypertension 2018; 71(5):946-954. Briggs R, Carey D, O’Halloran A, Kenny RA, Kennelly SP. Validation of the 8-item Centre for Epidemiological Studies Depression Scale in a cohort of community-dwelling older people: data from The Irish Longitudinal Study on Ageing (TILDA). European Geriatric Medicine 2018 Epub. Briggs R, Tobin K, Carey d, Kenny RA, Kennelly SP. What is the prevalence of untreated depression and death ideation in older people? Data from the Irish Longitudinal Study on Ageing. International Psychogeriatrics 2018;30(9):1393-1401. Briggs R, Carey D, Kenny RA, Kennelly SP. What is the Longitudinal Relationship between Gait Abnormalities and Depression in a Cohort of Community-Dwelling Older People? Data From the Irish Longitudinal Study on Ageing (TILDA). American Journal of Geriatric Psychiatry 2018;26(1):75-86. Briggs R, Kennelly SP, Kenny RA. Does baseline depression increase the risk of unexplained and accidental falls in a cohort of community-dwelling older people? Data from The Irish Longitudinal Study on Ageing (TILDA). International Journal of Geriatric Psychiatry 2018;33(2):e205-e211. Briggs R, McHale C, Fitzhenry D, O’Neill D, Kennelly SP. Dementia, Disclosing the Diagnosis. QJM 2017;111(4):215-216. Briggs R, Coughlan T, Doherty J, Collins DR, O'Neill D, Kennelly SP. Investigation and diagnostic formulation in patients admitted with transient loss of consciousness. Irish Medical Journal 2017;110(5):563. Briggs R, Kenny RA, Kennelly SP. Does baseline hypotension predict incident depression in a cohort of community-dwelling older people? Data from The Irish Longitudinal Study on Ageing (TILDA). Age and Ageing 2017;46(4):648-653. Briggs R, Dyer A, Nabeel S, Collins R, Doherty J, Coughlan T, O’Neill D, Kennelly SP. Dementia in the acute hospital: the prevalence and clinical outcomes of acutely unwell patients with dementia. QJM 2017; 110(1):33-37. Briggs R, Kenny RA, Kennelly SP. Systematic Review: The association between late life depression and hypotension. JAMDA 2016; 17:1076-1088. Briggs R, O’Shea E, de Siun A, O’Neill D, Gallagher P, Timmons S, Kennelly SP. Does admission to a specialist geriatric medicine ward lead to improvements in aspects of acute medical care for older patients with dementia? International Journal of Geriatric Psychiatry 2016 201;32(6):624-632. Briggs R, O’Neill D. The informant history: a neglected aspect of clinical education and practice. QJM 2016; 109(5):301-302. Briggs R, Kennelly SP, O’Neill D. Drug treatments in Alzheimer's disease. Clinical Medicine 2016;16(3):247-53. Briggs R, O’Neill D. Chronic stroke disease. British Journal of Hospital Medicine. 2016;77(5):C66-9. Briggs R, Coughlan T, Collins DR, O’Neill D, Kennelly SP. Acute hospital care: How much activity is attributable to caring for patients with dementia? QJM 2016;109(1):41-44. Briggs R, Harbison J. In-hospital Stroke: clinical characteristics and outcomes. Irish Medical Journal 2015;108(1):24-25. Grace AR, Briggs R, Kieran RE, Corcoran RM, Romero-Ortuno R, Coughlan TL, O'Neill D, Collins R, Kennelly SP. A Comparison of Beers and STOPP Criteria in Assessing Potentially Inappropriate Medications in Nursing Home Residents Attending the Emergency Department. JAMDA 2014;15(11):830-834. Briggs R, O’Neill D. Vascular Gait Dyspraxia. Clinical Medicine 2014;14(2):200-202. Briggs R, Holmerova I, Martin FC, O’Neill D. Towards Standards of Medical Care for Physicians in Nursing Homes. European Geriatric Medicine 2014;6:401-403. Briggs R, O’Neill D, Coughlan T, Collins R, Kennelly SP. Nursing home residents attending the emergency department: clinical characteristics and outcomes. QJM 2013;106(9):803-808. Robinson S, Briggs R, O’Neill D. Cognitive aging, geriatrics textbooks, and unintentional ageism. Journal of the American geriatrics Society 2012:60(11):2183-2185. Briggs R, Robinson S, O’Neill D. Standards of Nuring Home Care of medical care for nursing home residents in Europe. European Geriatric Medicine 2012;3(6):365-367. Briggs R, O’Neill D. Ageism and clinical research. Irish Medical Journal 2012;105(9):311-312.